Rintaro soon comes to realise that he has once again ended up in the alpha world line where Mayuri is dead, as the Rintaro of this world line couldn’t go through with sacrificing Kurisu in order to save her. 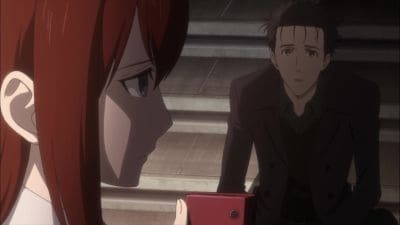 Realising that this Rintaro came from another world line, Kurisu reveals she has rebuilt the Phone Microwave, asking him to use it to return to his world line. As Rintaro struggles with his decision, Kurisu takes him to Mayuri’s grave, urging him to wake up from his dream. After advising Rintaro not to interact so much with Amadeus, Kurisu kisses Rintaro before sending a D-Mail, returning him to the beta world line.